Many of those thousands thought they were learning a lesson for life. They thought they could now see through the divide and conquer tactics of the government. They felt like the mud that caked their eyes had washed off, and now they could see the associations between politics and crime. And yet very quickly they reverted to type. They sat back and waited for the show to go on. They repeated the mantra about proof, wanting the comfort of other people being convinced before they could admit to what was staring at them in the face. And less then a year later, enough time has passed for all the lessons to be forgotten. Think about it. Times of Malta this morning reports that though the Egrant inquiry absolves Joseph and Michelle Muscat, it includes grounds for criminal action against ‘other people’. It does. It confirms Keith Schembri’s and Konrad Mizzi’s companies were set up with Egrant. It confirms Karl Cini chased banks half the way across the world to set up bank accounts for them. It confirms how they sought to cover it all up. But Times of Malta is not reporting possible action against them. Think about it. A magistrate draws up an inquiry report and hands it over, as is his duty, to the attorney general. What does the attorney general do? He hands it over to the subject of that inquiry and refuses to share it with anyone else. Now Times of Malta reports the subject of the inquiry, black pen in hand, is getting ready to share with us the full report but only after censoring out any inconvenient bits. In what universe is the subject of an inquiry an objective censor of a report into allegations about their conduct? How can they be reliable purveyors of information? Remember these people could not be trusted to redact a contract for energy supply. When the full version was leaked, we found the blacked out sections, as predicted, covered up corruption and insane procurement fuelled by it. Now the prime minister is getting ready to turn his guns of revenge. Intimidation is now official government policy. And you hear people say that’s only fair. After all, they ‘marked his children for life’. No sir. Joseph Muscat marked his children for life. No one did more to create the impression he owned Egrant than he did. The name of the company was out for a year together with Konrad Mizzi’s and Keith Schembri’s before anyone alleged it was his. Had he fired them in all that time, as logic dictated, no one would have suspected he was their number one. Instead, he protected them and continued to protect them. The prime minister is right to feel very powerful right now. He has long since abandoned the notion that power in a democracy is borrowed on condition that it is used as a force for good. Perhaps he was never inhibited by such niceties. His power is not fed by the magistrate’s report or even his spin on it. His power is fed by the willingness of people who would rather sit back and watch this as a spectacular piece of theatre that has nothing to do with them except to provide them with entertainment. Many children are yet to be marked by this story. Generations ahead will look back at a time when the true ownership of Egrant will be remembered merely as a pretext, like the burning of the Reichstag, for a period of oppression the like of which our young Republic has not yet known. 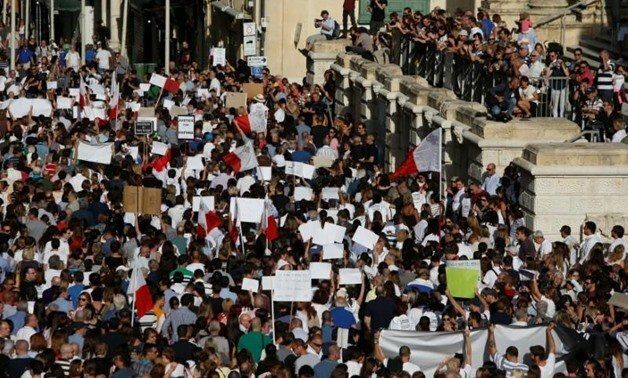 It may not be necessary for people to lose their life as Daphne Caruana Galizia has. But the few who will not look away will feel her loneliness. And her fear. Because heroes are not gods.